The following interview is approximately one hour long and has been conducted outdoors on October 21st, 2001 in a tent by the Kabul correspondent of Al-Jazeera, Tayseer Allouni, who has been stationed there with his family for about 2 years. We thank Islamic Awakening for granting permission to use and display material from their website (the following text comes entirely from that that website, including the introduction). The following interview is approximately one hour long and has been conducted outdoors on October 21st, 2001 in a tent by the Kabul correspondent of Al-Jazeera, Tayseer Allouni, who has been stationed there with his family for about 2 years, making him the only TV reporter with broadcast access to be allowed on the streets of Kabul and Kandahar. It should be also noted that he is the only journalist to have met with Commander Mullah `Umar, Shaykh Usamah bin Laden and many other talibs. He is originally from Syria, but presently living in Spain. Usamah bin Laden: May Allah greet you [hayyakallah]. Tayseer Allouni: A question that is repeated on the tongues of a lot of people all around the world: The USA claims that it has convincing proof of your involvement in the events of New York and Washington. What is your answer to that? UBL: Praise be to Allah, the Lord of the worlds. May Allah’s Peace and Blessings be upon Muhammad, his pure family and his noble Companions. To proceed: As to its description that these acts were terroristic, then that description is wrong. These young men, whom Allah has cleared the way for, they have shifted the battle to the heart of the United States and they have destroyed its most outstanding [abraz] landmarks, their economic landmarks and their military landmarks, that being with the grace of Allah [dhalika fadlu allah]. And they have done this from what we understand, and we have incited and roused for this [harradna] before, and it is in self-defense, defense of our brothers and sons in Palestine and for freeing our holy sites. And if inciting [tahrid] for this is terrorism, and if killing the ones that kill our sons is terrorism, then let history witness that we are terrorists. TA: Alright, but Shaykh, those who monitor your speeches and documents have connected the oath you have given recently, and you have said word for word: “I swear by Allah Almighty, Who lifted the sky without effort, that America will never enjoy safety, until safety becomes a reality for us living in Palestine.” So, it is easy for any follower of these events to connect between the terrorist events that happened in New York and Washington and that previous statement. So what is your opinion on these sayings? UBL: Making connections is easy. If it implies that we have incited for this, then yes, we’ve been inciting for years, and we released legal rulings [fataawa] and documents concerning this issue, and other incitements which were published and broadcasted in the media. So if they mean, or if you mean, that there is connection due to the incitement, then that is true. So we incite, and incitement is appointed [muta`ayyin] today, and Allah has asked it from the best of humans, the Prophet (sallallahu `alayhi wasallam). And what He meant as the goal for the disbelievers is fighting and combat. So that connection is right, that we have incited and roused for the killing of Americans and Jews. That is true. TA: Alright, Shaykh Usamah bin Laden, the al-Qai`dah Organization is facing today a state that dominates the world militarily, politically, and technologically. So with what reason does the al-Qai`dah Organization, whose material capabilities don’t precisely come close to the capabilities that the USA has, so with what logic can an organization, like al-Qai`dah, defeat the USA militarily for example? UBL: Alhamdulillah… I say that the battle isn’t between the al-Qai`dah Organization [tanzeem al-Qai`dah] and the world Crusaders. The battle is between Muslims – the people of Islam – and the world Crusaders. And that organization, with the grace of Allah [bifadlillah], used to be with our Afghan Mujaahideen brothers, and the people used to say words like this and even stronger: “How could you defeat the Soviet Empire ?” And at that time, the Soviet Empire was a force that was very, very strong, which scared the whole world and NATO used to shake in fear in front of the Soviet Empire. So where is that strong force that Allah (subhannahu wa ta`aala) has sent toward us [manna allahu `alayna] and our Mujaahideen brothers ? The Soviet Empire has become – with Allah’s grace – a figment of the imagination [athran ba`da `ayn, lit. traces before the eye]. Today, there is no more Soviet Empire, it split into smaller states and Russia is left. So the One (Allah) who prolonged us with one of His helping Hands and stabilized us (subhannahu wa ta`aala) to defeat the Soviet Empire, is capable (subhannahu wa ta`aala) to prolong us again and to allow us to defeat America on the same land (subhannahu wa ta`aala), and with the same sayings, and that is the grace of Allah [waa dhaalika fadlullah] (subhannahu wa ta`aala). So we believe that the defeat of America is something achievable – with the permission of Allah (subhannahu wa ta`aala) – and it is easier on us – with the permission of Allah (subhannahu wa ta`aala) – than the defeat of the Soviet Empire previously. TA: How do you think it’s easy? Why do you think it’s easier? UBL: We have tried…like our brothers who have engaged in battle with the Americans, similar to the example in Somalia. We have not found before a force that can be mentioned. There is a very huge awe [haala] about America, which it uses to scare people before it engages the battle. So our brothers that were here in Afghanistan tried, and Allah has cleared the path for them with some of the Mujaahideen in Somalia. So America left, dragging behind the tails of humiliation, defeat and loss, without turning back for anything [tajurru athyaal alkhayba wal hazimah wal khusraan laa talwee `alaa shay’], and it retreated before expected, and it forgot all that great media hype about the New World Order, and how it was the master of that order, and that it can do whatever it pleases. It forgot all those facts, and it picked up its armies and it retreated in defeat with Allah’s grace (subhannahu wa ta`aala). So we tried combat against the Russians, from ’79 until ’89, 10 years – with the grace of Allah (subhannahu wa ta`aala) – then we continued against the Communists in Afghanistan. Today we are at the end of the second week, and what a difference like night and day between both battles [shattaana shattaana bayna al-ma`rakatayn]. So we implore Allah (subhannahu wa ta`aala) to prolong us with one of His helping Hands [yamduduna bimadadin min `indihi] and to break America, for He is capable of that. TA: Alright Shaykh, in connection to the land, you have said that we will defeat America on this land. Don’t you think that the existance of the al-Qai`dah Organization on the land of Afghanistan is making the Afghan people pay a high price? UBL: Well, that view is partial and incomplete, and only from one angle. When we first came to Afghanistan, and when we came to give victory to the Mujaahideen when the Russians entered, in 1399H (1979AD), the Saudi government officially asked us to not enter Afghanistan. Due to my entry to Afghanistan, and due to my family’s closeness to the Saudi governmental system, a letter arrived commanding Usamah not to enter Afghanistan, and to stay with the Muhaajireen (immigrants) in Peshawar, because in case the Russians were to imprison or capture Usamah, then that would be proof showing Saudi backing of the Mujaahideen against the Soviet Empire. And during that time, the whole world shook in fear from the Soviet Empire, and I am not exaggerating about this prohibition (to enter Afghanistan), so from their point of view, this seemed damaging to them. They were forced because of their opinions. So when we came to the Afghans during the first time, we endured what we had to endure, in desire to liven the Islamic self [li ihyaa’ al-nafs al-muslima], and to safekeep the Muslim children and offspring here, and for victory for the religion [deen]. And that is a duty on all the Muslims, not just the Afghans. So if I went, or some of my brothers that came for jihaad, acted upon this duty, (which is) to bring victory to our brothers in Palestine, then that does not mean that Usamah alone has to endure this, but it is a duty [waajib] on all of the Islamic Nation [ummah] to endure this, because it is in the Way of Allah [feesabilillah] and jihaad is designated [muta`ayyin] today on all of us, on the Afghans and others, and it is true that they endure, but this is an Islamic duty [waajib shar`i] and it is a duty for them and others to support this [feesabilillah]…. Usamah bin Laden: …. and in addition to the matters related to the bombing of the Afghans that say that it is only due to us (the Mujaahideen), the reason is not personal. America didn’t start by taking my money and didn’t hurt me at all, but due to our incitement against the Jews and the Americans in protection of the Islamic Nation [difaa`an `an ummatil islaam], those words came from them. And it is a known fact that America is against the establishment of any Islamic state, and the Prince of Believers [Ameerul Mu’mineen, Mullah Muhammad `Umar of Kandahar] has declared that on more than one occasion, and so have a lot of the big students [talibs], indicating that they are targeted because of their religion [deen], not just because of the presence of Usamah bin Laden. And like he (Mullah `Umar) said, the British came and they were defeated in Afghanistan before Usamah was to be found here, and the Russians came, before we did, and now the Americans have come, and we implore Allah to defeat them like He defeated their previous allies. TA: Let us go back to the transgressions that happened in New York and Washington. What is your analysis about what happened – its effect on America, and its effect on the Islamic world? The question in two parts, if you please. UBL: I say the events that happened on Tuesday 11th September on New York and Washington, that is truly a great event in all measures, and it’s claims until this moment are not over and are still continuing. And if the fall of the towers, with the twins on it’s head, was an event that was huge, then consider the events that followed it… let us talk about the economic claims [tadaa`iyat iqtisaadiyah], which are still continuing. According to their own admissions, the share of the losses on the Wall Street Market reached 16%. They said that this number is a record, which has never happened since the opening of the market more than 230 years ago. This large collapse has never happened. The gross amount that is traded in that market reaches 4 trillions dollars. So if we multiply 16% with $4 trillion to find out the loss that affected the stocks, it reaches $640 billion of losses from stocks, with Allah’s grace (subhannahu wa ta`aala). So this amount, for example, is the budget [miizaniyah] of Sudan for 640 years. They have lost this, due to an attack that happened with the success of Allah lasting one hour only. The daily income of the American nation is $20 billion. The first week they didn’t work at all due to the psychological shock of the attack, and even until today some don’t work due to the attack. So if you multiply $20 billion by 1 week, it comes out to $140 billion, and it is even bigger than this. If you add it to the $640 billion, we’ve reached how much? Approximately $800 billion. The cost of the building losses and construction losses? Let us say more than $30 billion. Then they have fired or liquidated until today, or a couple of days ago, from the airline companies more than 170,000 employees. That includes cargo plane companies, and commercial airlines, and American studies and analysis have mentioned that 70% of the American people even until today still suffer from depression and psychological trauma, after the incident of the two towers, and the attack on the Defense Ministry, the Pentagon – thanks to Allah’s grace (subhannahu wa ta`aala). One of the well-known American hotel companies, Intercontinental, has fired 20,000 employees – thanks to Allah’s grace (subhannahu wa ta’aala). Those claims cannot be calculated by anyone due to their very large scale, multitude and complexity – and it is increasing thanks to Allah’s grace (subhannahu wa ta`aala) – so watch as the amount reaches no less than $1 trillion by the lowest estimate – thanks to Allah’s grace (subhannahu wa ta`aala) – due to these successful and blessed attacks. We implore Allah to accept those brothers within the ranks of the martyrs, and to admit them to the highest levels of Paradise. But I mention that there are also other events that took place, bigger, greater and more dangerous than the collapse of the towers. It is that this Western civilization, which is backed by America, has lots its values and appeal [qiyamuhaa]. The immense materialistic towers were destroyed, which preach Freedom, and Human Rights, and Equality. It became a total mockery [hadhaa’an manthuura] and that clearly appeared when the US government interfered and banned the media outlets from airing our words which don’t exceed a few minutes, because they felt that the truth started to appear to the American people, and that we truly aren’t terrorists by the definition they want, but because we are being violated in Palestine, in Iraq, in Lebanon, in Sudan, in Somalia, in Kashmir, in the Philippines and in every place, and that this is a reaction from the young men of this nation [ummah] against the violations by the British Government. Therefore, they declared what they declared, and they ordered what they ordered, and they forgot everything they mentioned about Free Speech, and Unbiased Opinion and all those matters. So I say that Freedom and Rights in America, and Human Rights, have been sent forward to the guillotine with no return unless they are quickly reinstated. The government will take the American people and the West in general will enter into a choking life, into an unsupportable hell, because of the fact that those governments have very strong ties, and are under the payroll, of the Zionist lobby, which serves the needs of Israel who kills our sons and our children without right so that they can keep on ruling with total control. TA: As for the effects of these actions on the Islamic world, there has been a clash of opinions. There are some that say things that have been believed in the Islamic world, and you hear all the official statements, and the statements of the people that can make statements, always saying that those attacks are terrorist actions and that these are innocent civilians, and that we won’t accept those attacks, and that those things don’t concord with the modern Islamic religion, and along those lines. So what is your opinion concerning what you have been able to follow of news concerning what happens in the Islamic world with the network that you own or run all around the world? UBL: I say that the events have proved in a very clear manner the magnitude of the terrorism America inflicts in the world. So Bush admitted that there can only be two kinds of people: one being Bush and his followers, and any nation that doesn’t follow the Bush government, or the World Crusade, then they are guaranteed to be with the terrorists. So what kind of terrorism is more terrifying and clearer than that? So a lot of countries that can’t speak for themselves, followed that strong world terrorism, and were also forced to say at the beginning that they were with him (Bush), and they all know without any doubt that we fight to protect our brothers and our holy sites. So the declarations of the leaders, either in the East or the West, were that the causes and roots of terrorism have to be removed. After asking what they are, they said it is the Palestine issue. We being part of a fair issue, but in fear of America, they could not say that our issue is fair, so they call us terrorists and then ask us to fix the Palestine issue. So based on those recent events and what they ensued, Bush and Blair quickly moved and said that now is the time to create an independent nation for Palestine. Subhanallah[meaning, “Glory unto Allah,” in this usage as “Amazing!”] !! During the last 10 years the time was not ready, only until the attacks happened?? So they won’t wisen up without the language of beatings and killings. So like they kill us, without a doubt we have to kill them, until we obtain a balance in terror [tawaazun fil ru`b]. This is the first time that the scale of terror got closer between both sides, between the Muslims and the Americans in these recent times, and those Americans did to us whatever they pleased, and the victim isn’t even allowed to cry. And then Clinton comes out and tells us that Israel has the right to defend itself, after the slaughter of Qanaa (in Lebanon). They didn’t even give the Israelis a warning! And when the new President Bush came with Minister Colin Powell, within the first months of their rule, they said that they would move the US embassy from Tel Aviv to Jerusalem, and Jerusalem will be the eternal capital of Israel, and the Congress and the Senate clapped for them. That is hypocrisy beyond any hypocrisy, and this is a clear mistreatment. They will not wisen unless the attacks fall on their heads, and with the grace of Allah (subhannahu wa ta`aala), the battle has moved inside America. We will strive to keep it going – with Allah’s permission – until victory is attained or until we meet Allah (subhannahu wa ta`aala) (through martyrdom). TA: But Shaykh, from what I see from your answers, you say them always about Palestine and about the Palestinian issue. So let me ask you the question, your latest statements, or precisely a statement that appeared a few years ago that preached killing Jews and Crusaders, and we remember that the title had between quotes a famous hadeeth, “Expel the mushrikeen(polytheists) from the Arabian peninsula”[narrated by al-Bukhaari (2932) and Muslim (3089)], you concentrated on the expulsion of the Americans from the Arabian peninsula. So in your latest speeches we see a decrease in that. You have put forth the Palestinian issue, or like you call it the Aqsa issue, to the forefront, and you moved the issue of the Haramain to a secondary spot so to speak. So what is your opinion or argument on this matter? UBL: I say that with no doubt jihaad is mandatory on all Muslims [fard `ayn] to free the Aqsa, or to save the weak in Palestine and in Lebanon and in Iraq and in all Islamic lands, and there is no doubt that freeing the Arabian peninsula from the polytheists [mushrikeen] is also mandatory on all Muslims [fard `ayn]. And concerning the talk that Usamah has put the Palestinian issue to the forefront, that is not true. “Al-`Abd al-Faqir” has a speech from the year 1407H (1986AD) that incites Muslims to boycott American products, and I used to say that the Americans take our money and give it to the Jews so they can kill our children with it in Palestine. That is mandatory on all Muslims [fard `ayn] and this is mandatory on all Muslims [fard `ayn], and there are a lot of mandatory things [furood a`yaan] in jihaad, like Kashmir amongst others, and from the battle front that was created a few years ago, the title of which was called: “The Islamic Front of Jihaad Against the Jews and Crusaders” [al-Jabha al-Islaamiyya lil-Jihaad Dudda al-Yahood wal-Saliibiyeen]. So our mention of those two issues or two topics, is of utmost importance. So some of the events of recent times might push one issue over the other, so we move towards that direction, without ignoring the other. TA: What are the events that have pushed you to the Palestinian issue? UBL: In recent times, the new rise of the blessed Intifada, the Intifada of Rajab. It helped push towards that direction, and that was the biggest reason that helped this issue, and concerning our pushing, we only strive to do our duty without feeling religiously ashamed. All the above issues affect each other. The attack on the Americans concerning the Palestine issue helps in regards to the Haramain issue, and vice versa, and attacking the Americans because they are considered to be a protective shield for the Jews in the areas of Tabook (a Northern Saudi province close to Jordan, home of the King Faisal Air Base) and the eastern regions (of Saudia). TA: Alright Shaykh, now concerning the Jews and the Crusaders, like you say, you have written fataawa concerning the presence of jihaad against the Jews and Crusaders. From what we have seen from other fataawa written by scholars, there are some that support you, but there are also some who argued and some who protested your fataawa. They say under which basis can we kill a Jew just because of his religion? Or the Crusader or the Nazarene (Christian), because of his religion only? So your fataawa have differed and don’t have any relation with the fataawa of the other scholars. UBL: Alhamdulillah. I will say that these issues have raised a lot of fataawa from the Muslims. In Pakistan, there are a lot of the fataawa that appeared from scholars, one of the biggest being Mufti Nizamudeen Shaamzi (Head legal advisor of the Taliban), and in the land of the Arabs, precisely the land of the Haramain, a lot of approved and repeated fataawa appeared. One of the best of them being that of Shaykh Hammood bin `Abdullah bin Uqla ash-Shu`aybee, may Allah bless his life, who is one of the biggest scholars in the homes of the Haramain, who incites the duty of fighting the Americans and fighting the Israelis in Palestine, making their blood and wealth permissible [yubihu dimaa’ihim wa amwaalihim]. Also appeared a fatwa from Shaykh Sulaymaan al-`Ulwaan, and also appeared a book written by one of the talibs of knowledge, The Truth About the Modern Crusader Wars [Haqiiqat al-Huroob al-Saliibiyah al-Jadeedah], and he denounced those who say that this fighting is invalid, and whoever disagrees with true sharee`ah, and spoke against other wrongdoings [mafaasiq]. Yes, so he wrote well, we implore Allah to bless him. TA: What about the killing of innocent civilians? UBL: Killing innocent civilians, like Americans and other educated people say, is something very weird to be said. I mean, who is the one that said that our children and our civilians are not innocents, and that their blood is permissible [mubaah] ? In the case we kill their civilians, the whole world yells at us from east to west, and America would start pushing its allies and puppets. Who is the one that said that our blood isn’t blood and their blood is blood? Who is the one that declared this? What about the people that have been killed in our lands for decades? More than 1,000,000 children died in Iraq and are still dying, so why don’t we hear people that cry or protest or anyone who reassures or anyone who gives condolences??!? And it is said in truth of our Prophet (sallallahu `alayhi wasallam) in the hadeeth saheeh: “A woman has entered hell because of a cat it tied without giving it food or without letting it eat from the blessings of the earth.” [narrated by al-Bukhaari (2236) and Muslim (2242)] And that is just because of a cat, so what about the millions of Muslims that are getting killed?? Where are the educated?? Where are the writers?? Where are the scholars?? Where are the free?? Where are the ones who have one atom of faith [imaan] in their hearts?? How do these people move when civilians die in the America, when we are killed everyday?? Everyday in Palestine, children are killed. There is a great dysfunction in people today, which needs to be stopped right away by all means, and to recalculate the numbers (of the dead). There is a strong instinct in humans, in which they lean towards the strong without feeling it, so when they talk about us, they know we will not answer them, and if they stand behind the lines of the governments and the Americans, they will think that they will feel something we don’t. A long time ago, one of the Kings that came on the ancient Arabs killed a man from the Arabs [story mentioned in the 85th Surah (al-Burooj), and narrated by Muslim (4/7148)], so the people became tamed to the fact that Kings kill humans. So the brother of the deceased stood in the front of the king and killed him, and when the victim who lost his brother was victorious, the people criticized him, saying: “You kill a King just because of your brother?” So who permitted that King? These are both equals souls, and the blood of the Muslims is equal, and in those times their blood was equal, so that gentle man replied: “My brother is my King.” And today all our brothers in Palestine are our Kings, so we kill the Kings of disbelief [kufr] and the Kings of the Crusaders, and the civilians amongst the disbelievers, as opposed to the amount of our sons they kill, and that is correct both religiously and logically. Tayseer Allouni: So you say that this is treatment with the same action? They kill our innocent, so we kill theirs? TA: What is their proof? TA: This is what we are asking about exactly! This is what we are exactly questioning ourselves about! UBL: …But this forbiding of killing children and innocents… is not general [mutlaqan] and there are other writings that uphold it [nusus ukhra tuqayiduhu]. TA: What about the World Trade Center…? UBL: As for the World Trade Center, the ones who were attacked and who died in it were a financial power. It wasn’t a children’s school! And it wasn’t a residence. And the general consensus is that most of the people who were in there were men that backed the biggest financial force in the world that spreads worldwide mischief [ta`ithu fil ardi fasaadaa]. And those individuals should stand for Allah, and to re-think and re-do their calculations. We treat others like they treat us. Those who kill our women and our innocent, we kill their women and innocent, until they stop from doing so. TA: But now, Shaykh Usamah, the media outlets and the security services also, say that you lead a network with a very big reach, which spreads over 40 or 50 countries as some say, and that the al-Qai`dah Organization has very big capabilities, and that you use those capabilities a lot to order missions. That you support many Islamic Organizations or movements, which are called in some places “terroristic.” The question that we ask you is, what is the magnitude of the involvement of the al-Qai`dah Organization, or what is the type of involvement that exists between the al-Qai`dah Organization and with the personality of Usamah bin Laden? UBL: Alhamdulillah. I say in response to what you said, and which I have stated before, that this matter isn’t about any specific person [laa yakhussu al-`abd al-faqir, lit. doesnt involve the poor servant], and that it is not about the al-Qai`dah Organization. We are the children of an Islamic Nation, with Prophet Muhammad (sallallahu `alayhi wasallam) as its leader, our Lord is one (subhannahu wa ta`aala), our Prophet is one (sallallahu `alayhi wasallam), our Qibla (the direction Muslims face during prayer) is one, we are one nation [ummah], and our Book (the Qur’an) is one. And this blessed Book, with the tradition [Sunnah] of our generous Prophet (sallallahu `alayhi wasallam), has religiously commanded us [alzamatna] with the brotherhood of faith [ukhuwat al-imaan], and all the true believers [mu’mineen] are brothers. So the situation isn’t like the West portrays it, that there is an “organization” with a specific name (such as “al-Qai`dah”) and so on. That particular name is very old. It was born without any intention from us. Brother Abu Ubaida (rahimahullah) al-Banshiri [Panjshiri, which is a a large valley north of Kabul populated by Tajiks] created a military base to train the young men to fight against the vicious, arrogant, brutal, terrorizing Soviet empire, which was a truth to all observers [al-baghi, al-ghaashim, al-mulhid, al-irhaabi haqiqatan lil mu’aamilin]. So this place was called “The Base” [“Al-Qai`dah“], as in a training base, so this name grew and became. We aren’t separated from this nation [ummah]. We are the children of a nation, and we are an unseperable part of it, and from those public demonstrations which spread from the far east, from the Philippines, to Indonesia, to Malaysia, to India, to Pakistan, reaching Mauritania… and so we discuss the conscience of this nation [ummah]. TA: Alright, Shaykh Usamah, what is your strategy concerning the Arab states? What is being seen is that some Arab states have discussed what happened in New York and Washington and they have backed the American claims against you, and by standing behind what happened in New York and Washington. Some Arab states were most strong in their criticism, like for example the latest speech of the Saudi Interior Minister, who warned against you personally, and warned against the following of your curriculum [nahjikum] and what you say. So do you have a specific strategy for Arab nations? And what is your answer about the latest declaration by the Saudi Interior Minister? UBL: I assure that we are a part of this nation [ummah], that our goal is the victory of our nation, and the struggle to lift mischief, inequality, irresponsibility and the acceptance of staying away from them [dhul, dhulm, hawaan, wal qunuu` `anha], and the removal of the man-made laws that America has forced on its agents in the area so that this nation [ummah] could be ruled by the Book that has been sent down by its Creator, Allah (subhannahu wa ta`aala). So I listened to some of the words of the Interior Minister and he blamed us directly, also saying that “those people call Muslims disbelievers” [yukaffiruna al-muslemeen] – we seek Allah’s refuge from this [ma`athallah min thalik]! We think that the Muslims are Muslims, and we don’t call any Muslims disbelievers unless they specifically commit one of the well-known big wrongdoings [naaqitha] of Islam, while having full knowledge that this is one of the actions of wrongdoings in religion. So I say that, in general, our concern is that this nation [ummah] unites either under the Words of the Book of Allah (subhannahu wa ta`aala) or His Prophet (sallallahu `alayhi wasallam), and the movement of this nation to the establishment of the righteous Khilafah of the nation [ummah], which has been prophesized by our Prophet (sallallahu `alayhi wasallam) in his hadeeth saheeh [narrated by at-Tirmidhi], that the righteous Khilafah will return with the permission of Allah (sallallahu `alayhi wasallam), and the nation [ummah] is asked to unite itself under this Crusaders’ campaign, the strongest, most powerful, and most ferocious [ashad wa a`naf wa ashras] Crusaders’ campaign to fall on the Islamic nation [ummah] since the dawn of Islamic history. There has been past Crusader wars, but there has never been a campaign like this one before. So Bush has declared with his own tongue (words): “Crusade attack.” [Usamah bin Laden pronounced these words in English] So the odd in this is that they have said what we didn’t have to say (that this war is a crusade). Some people also believe, as it is said about us, like the Minister’s words, that we make takfeer on Muslims – we seek Allah’s refuge from this [ma`athallahu min thaalik]! But, when Bush speaks, people make apologies for him and they say that he didn’t mean that this war is a Crusade, even though he said himself that it was a Crusade!! TA: Falls into this apostasy?? UBL: No… No, it is not a big part. This is the rule of Allah (subhannahu wa ta`aala), and a clear statement in His generous Book, and it is one of the clearest of rulings! TA: And the Arab and Islamic governments…? TA: Just to make things clear, if you please. Isn’t it possible to forgive those states that are considered to be impotent and weak [maghluub `ala amrihaa, lit. whos command has been defeated]. Let us take the state of Qatar, for example. The state of Qatar is a small state, whose Foreign Minister once said that he is surrounded by a supreme force that can wipe out his existence in all ease. Therefore, he is forced to become an ally of America and others. Isn’t it possible to forgive such states? Like Kuwait, for example? Or Bahrain? Now let’s say (for example), if the Emir of Qatar came and he ordered one of his men to kill your son, then we came to that soldier asking him why he killed the son of brother Tayseer, so he says: “Well brother, I am forced to do it! [yaa akhee, ana mukrah] And you know brother Tayseer, that you mean a great deal to me, but I am obligated (forced to kill your son)! [ana mukrah]”. So the blood of the Muslims will be lost with these kind of excuses, with this compulsion [ikrah] that isn’t backed by the Islamic Law [sharee`ah]. The soul of that soldier isn’t better than the soul of your son. If he is killed, he will be killed by violation and oppression [wa huwa mathluman], but he (the soldier) isn’t allowed to obey the Tyrant (!) by killing your son. So this compulsion [ikrah] isn’t religiously allowed. 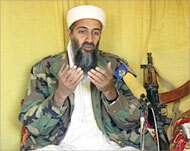 Usamah bin Laden: I say that there is no doubt in this. This is a very clear matter, proven in the Book and the Sunnah, and any true believer [mu’min] who claims to be faithful shouldn’t belie [yukathib] these truths, no matter what so and so says about it [qaala biha `amr am lam yaqul bihaa]. What goes for us [al-mu`tabar `induna] is whatever is found in the Book of Allah and the Sunnah of the Prophet (sallallahu `alayhi wasallam). But, the Jews and America have come up with a fairytale that they count to the Muslims, and they’ve been unfortunately followed by the local rulers (of the Muslims) and a lot of people who are close to them, by using “world peace” as an excuse. That is a fairytale [khuraafah, meaning, a fictional matter] which has no basis whatsoever! And whoever claims that there is permanent peace between us and the Jews, then he has disbelieved [kafarah] from what has been sent down on Muhammad (sallallahu `alayhi wasallam), and the battle is between us and the enemies of Islam, and that will go on until the Hour, and the so-called “Peace” or “Peace award” (Nobel Peace Prize), that is a fairytale that is given to the biggest blood-shedders [safaaheen]. That man (Ronald) Reagan, the perpetrator of the Der Yassin massacre, was awarded the Peace Prize. That traitor Anwar al-Sadat, the one that sold the land and the (Palestinian) issue and the blood of the martyrs, was awarded the Peace Prize. And unfortunately, that is ruling on the Islamic world today, with its big leaders, and its famous rulers, so it is a trick, they trick people and lie to them, but, with the permission of Allah, the liberation and release of Allah is close [faraju allahi qareeb], and the promised victory is close – Allah willing. TA: So we can deduce from the words of Shaykh Usamah bin Laden that he refers to the ordeal that Afghanistan is going through right now, and the war that America is waging with its allies, that it falls in the circle of a battle between the Crusaders, or whom you call Crusaders, and Islam. Alright, so how do you see an exit from this ordeal? UBL: We are in a strong and brutal battle, like I have mentioned today, between us and the Jews, with Israel being the spearhead, and whomever backs it from Zionists and Crusaders. So we have not hesitated [lam natawarra`] in the killing of the Jews who conquered the sanctuary of our Prophet (sallallahu `alayhi wasallam). And the ones who kill our children and women and brothers night and day, and whomever stands in their trench, he only has himself to blame [falaa yalumnna illa nafsihi]. So if you meant how is the exit from the ordeal, then this is in the hands of the others. Like we have been violated [i`tidaa’], so our first duty is to remove this violation. So whoever violated us, let him remove the violation. The Jews, it appears to us and appears from the writing of the Prophet (sallallahu `alayhi wasallam) that we will have to fight them under that name and on this land, in this blessed land which has the sanctuary of our Prophet (sallallahu `alayhi wasallam) [nasra]. And the United States has engaged its people and it engaged itself [aqhamat nafsaha] over and over for more than 53 years, and it was the one which recognized Israel, and it was the one which supported it, and it was the one that dispatched a general air bridge [jisran jawiyan `aam] in 1393H (1973AD) during the days of Nixon, from America to Tel Aviv, with weapons and aid and men, which has effected the events of the battle, so how could we not fight it (America)? It is a duty on every Muslim to fight it. So if it wants to survive, we have said some simple words, but America has terrorized and it has erased its values [amhat qiyamaha]. They have made laughable claims. They said that there is ciphering (i.e. hidden messages) in Usamah’s letters intended for terrorists. It is like we are living in the times of pigeon carriers, without the existence of telephones, without travelers, without Internet, without regular mail, without faxes, without e-mail. So these are laughable matters. They belittle people’s intellects [yastakhiffun bi `uqul alnaas], and these are just words. We swore that America will never dream of safety, until safety becomes a reality for us living in Palestine [amrika lan tahlama bil-amn, hataa na`ishuhu waaqi`an fee filistin]. That has exposed the American government, and that it lives as an agent of Israel, and it puts Israel’s needs on top of the needs of its own people. So the case is easy, America won’t be able to leave this ordeal unless it leaves the Arabian peninsula, and it stops its involvement in Palestine, and in all the Islamic world. If we gave this equation (problem) to any child in any American school, he will easily solve it within second. But, according to Bush’s actions, the equation won’t be solved unless the swords fall on their heads, with the permission of Allah. TA: Alright, Shaykh Usamah, do you have any message you want to address to the viewers? UBL: I say: Concerning this ordeal and this battle between Islam and Crusaders, I want to reiterate that we will continue – with the permission of Allah – this jihaad and the incitement of the nation [ummah] for it, until we get it while blessing us [hataa nalqahu wa huwa raadin `anna], and the war, like we have been promised, that is going on between us and the Jews. So any nation that joins the Jewish trenches has only itself to blame, and as Shaykh Sulayman Abu-Gaith has declared in some his previous statements, concerning America and Britain, so that should not be etched [fahaatha laysa lil hafr, meaning, those sayings shouldn’t be taken literally], but indeed he gave some of other nations a chance to review its calculations. What is Japan’s concern? What is making Japan join this hard, strong and ferocious war? It is a blatant violation of our children in Palestine, and Japan didn’t predict it will be at war with us, so it should review where it stands. What is the concern of Australia in the farthest south with the case of those weak Afghans? And those weak in Palestine? What is Germany’s concern with this war? Besides disbelief and crusade, it is a war which is repeating (bringing back) the Crusades, similarly to the previous wars. Richard LionHeart, and Barbarossa from Germany, and Louis from France… similarly is the case today, when they all immediately went forward the day Bush lifted the cross. The Crusader nations went forward. What is the concern of the Arab nations in this Crusaders’ War? They entered it openly, without disguise, in broad daylight [safaaran, jahaaran, nahaaran]. They have accepted to be ruled by the cross. Everyone that supports Bush with one word, even without offering facilitations and aid [tasheelaat], and whatever is so-called facilitations, is only a great treachery. They change its names by not calling it military aid. They join them in killing our sons, and they tell us that it is not facilitation and help?? How can we believe that this system (i.e. the Arab governments) is collecting aid to help the weak Afghans, while being the main reason in openly giving the Haramain to the Americans and their allies? How do we believe them while they are one of main reasons for the death of more than 1 million children? I say to those people who walk behind those rulers, don’t they have hearts? Don’t they have faith [imaan]? How can they declare faith [imaan] while they are helping those fornicating disbelievers [al-kafara al-fajara, fajar is the root of a 4-letter English word that starts with F] against the children of Islam? They help them against our children in Iraq and Palestine. So let them fear Allah, and repent, and let them remove the siege from those innocent children. So the Westerners are free, Europe wants to enter the war, that is their prerogative, but our duty is to fight whomever is in the trench of the Jews. America and the American people are free, they have entered the trench, and they will get what is coming to them. And concerning us, we are in worship and in jihaad, it is said in truth about our Prophet (sallallahu `alayhi wasallam): “Verily a man’s standing firm in the ranks for one hour (in jihaad) in the Way of Allah, the Mighty and Majestic, is more virtuous than 60 years of worship.” [Collected by al-Bayhaqee; Al-Albaanee called it saheeh in Saheeh Jaami` As-Sagheer (#5151)] So what matter is better than that? Under the pride of Allah (subhannahu wa ta`aala), we ask the Almighty to accept from us and from you, and concerning the Muslims, I tell them to trust in the victory of Allah (subhannahu wa ta`aala), and to answer the call of Allah (subhannahu wa ta`aala), and the order of His Prophet (sallallahu `alayhi wasallam), with jihaad against world disbelief [kufr al-`aalamin]. And I swear by Allah, happy are the ones who are martyred today, happy are the ones who are honored to stand under the banner of Muhammad (sallallahu `alayhi wasallam), under the banner of Islam, to fight the world Crusade. So let every person amongst them come forward to fight those Jews and Americans, and their killing is from the most important duties and most pressing things, and let them remember the teaching of the Prophet (sallallahu `alayhi wasallam), when he said to the child Ibn Abbaas (radiyallahu `anahum): “Young man, I shall teach you some of words (of advice): Be mindful of Allah, and Allah will protect you. Be mindful of Allah, and you will find Him in front of you. If you ask, ask of Allah; If you seek help, seek help of Allah. Know that if the world were to gather together to benefit you with anything, it would benefit you only with something that Allah had already prescribed for you, and that if they gather together to harm you with anything, they would harm you only with something Allaah had already prescribed for you. The pens have been lifted and the pages have dried.” [narrated by Ahmad, at-Tirmidhi, and others] So don’t discuss the killing of Americans with anyone, trust in the divine favor [baraka] of Allah, and remember your appointment with Allah (subhannahu wa ta`aala) with the presence of the Best of Prophets (sallallahu `alayhi wasallam).